All other ducks and geese. Actual alert and alarm calls recorded in the wild. 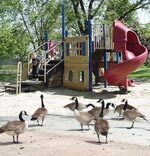 GooseBuster is the first and only geese control repeller to use actual alert and alarm calls of Canadian geese, recorded under natural conditions. Geese recognize these calls and respond instinctively( to 'alert' calls indicating uneasiness about potential danger and 'alarm' calls signifying immediate danger). Reacting to either, they evacuate instantly, without waiting to identify the source. Different calls in random combinations. GooseBuster geese control broadcasts its calls in random combinations. Calls differ in frequency, duration and intervals. Sound combinations, sequences and speaker selection change randomly, leading geese to perceive many birds in many locations. 23 years of research. GooseBuster is the tangible result of 23 years of research conducted by Dr. Philip Whitford, Professor of Biology at Capital University. Since 1979, Dr. Whitford has been studying Canada goose behavior and vocal communications, then presenting and publishing his findings. He holds a PhD in biological sciences in the field of animal behavior, and BS and MS degrees in wildlife management. New arrivals leave abruptly in a panic, encouraging original residents to leave as well. SPEAKER SEQUENCING - imitates natural patterns of 1) a moving goose, looking around at disturbances; and 2) several agitated geese. RANDOM PLAY - sounds are alwayschanging, preventing acclimation. LONG TERM SOLUTION - Geese are stubborn and territorial, and return to the same place year after year. But GooseBuster geese control repeller uses this memory against them - once scared away repeatedly, they rarely return. COVERAGE - One unit: 5-7 acres. EXTRA COVERAGE - Two units: 15-21 acres. Field tests show that a second unit increases coverage dramatically. This additive effect more than doubles the coverage (in fact it increases up to three times) reducing the per-acre cost significantly.